a.) SHORT-TERM TRANSIENT OCCUPANCY AGREEMENT: Once you have booked a cottage, you will receive a Confirmation E-mail with a link to your customized e-Signature Short-Term Transient Rental Agreement. To finalize your reservation, you must read and initial each page, and complete any and all applicable sections therein within 10 days of making your reservation. Once completed, you will receive an instant confirmation of receipt of your signed contract as well as the Cottage Guide which includes Check-In/Out instructions, , driving directions to the property, WiFi username and password (i/a) and more. b.) RESERVATION CONFIRMATION: All reservations will be confirmed by phone with one of our Reservation Agents, even if booked online. Should our agent determine the chosen property does not and cannot meet your requirements or requests, said agent may have you select an alternate property. If no other property is available, your monies will be refunded less the Processing Fee. c.) CHECK-IN: Starts at 4:00 PM on arrival day. If you will be arriving after 6:00 PM, please inform our office as soon as possible so our After-Hours staff knows not to expect you until late. If you are checking-in directly at the property, we require the guest calls our Check-In Phone Line upon arrival.CHECK-OUT: No later than 10:00 AM on departure day. You will be asked to either return the cottage key to its Lock Box at the property or return them to our Boothbay office. More house-specific detailed instructions are included in the Welcome Cottage Guide sent to guests after completing their Occupancy agreement. This guide includes driving Directions, as well as House Rules, Local Emergency Contact Info, Lock Box Code, Wifi Info, Local Area suggestions and more. d.) TRASH REMOVAL: If the Property you are renting is outside of the Boothbay Harbor Region, you may be given directions to the local transfer station. This means you, the guest, are responsible for taking your own trash and recyclables to the local transfer station during and after your stay. For cottages with scheduled weekly trash pick up, all trash must be out in barrels no later than 8:00 AM on the designated Trash Days. More detailed instructions included in your Guest Welcome Guide. FAILURE TO COMPLY WITH TRASH REMOVAL INSTRUCTIONS COULD RESULT IN ADDITIONAL FEES CHARGED TO THE GUEST. Please remember to take care of and respect the Property as if it were your own. e.) FINAL CONFIRMATION: Two Weeks prior to your arrival date, you will receive an Arrival Newsletter & Final Confirmation email. This will include another link to the appropriate Cottage Guide. f.) PETS: Many of our properties accept pets WITH PERMISSION from CCM and the Property Owner, some properties DO NOT. If pets are permitted in a Property, it will be noted on the Property's website page. Pets are not allowed on the Property unless 1 approval is received during the reservation process, 2 our Pet Policy instructions are fully-complete and 3 a non-refundable fee is paid as part of the reservation cost. For insurance purposes, some breeds are not permitted. We require the age and breed of your pets and THE veterinarian's contact as part of the Pet Policy section of the Short-Term Transient Occupancy Agreement. Service and assistance animals are not considered pets. g.) SMOKING/FIRE/FIREWORKS: NO SMOKING AND./OR FIREWORKS ALLOWED INSIDE OR OUTSIDE ANY PROPERTY MANAGED BY CCM, INC. If evidence of smoking is found, it will result in a cleaning fee/penalty and possible eviction without refund. Use of Fireworks will result in termination of your Occupancy Agreement without refund. h.) OCCUPANCY STANDARDS: All CCM, Inc. rental properties have maximum occupancy limits as specified on the Property Web page and in the Occupancy Agreement which must be strictly adhered to. Any violation of these limits will be grounds for eviction without refund. Many cottages and homes in Maine are on delicate septic systems (not public sewer) and as such have limits on what they can handle. There are to be no parties or gatherings of more people than the occupancy limit at any time without prior Owner/CCM approval. i.) PAYMENTS: Depending on what time of year you make a reservation, Prior to January 1st, booking deposits are 25%; Between January 1st - April 30th booking deposits are 50%, and starting May 1st, full payment is due at time of booking. Reservations made within 60 days of arrival, at any time of year, require full payment at time of booking. j.) 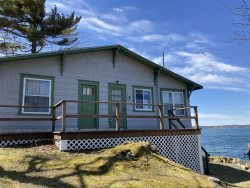 CANCELATIONS: Maine's coast has a very short rental season. If you must cancel your reservation for any reason within 90 days of arrival, your reservation is non-refundable. If canceling for any reason outside of 90 days, canceling parties will receive all monies back minus 25% of the reservation total. We highly recommend purchasing Travel Insurance; for more info about CSA Travel Insurance, please call us at 1-800-823-9501. Cottage Connection will attempt to re-book said property for the same time period; If we are successful in re-booking, canceling parties will receive a full refund of all monies paid, minus a $250 cancellation fee and the processing/administrative fee. k.) PROPERTIES FOR SALE: If a property is For Sale at the time a rental reservation is made, a real estate broker will be allowed to show the property with 24-hour notice to the guest. If you would prefer not to have this kind of experience during your stay, please select a property that is not for sale; we will gladly help you find an alternative property. Renter agrees and confirms that they have read the Terms and Conditions and FAQS sections of our Cottage Connection website prior to arrival.